Meet attorneys from EFF at Black Hat! Stop by our vendor booth to find out about EFF's latest work. You can even join EFF or renew your membership on the spot! The Black Hat Briefings remains the biggest and the most important technical security conference series in the world by remaining true to our core value: serving the information security community by delivering timely, actionable security information in a friendly, vendor-neutral environment. The knowledge presented at Black Hat USA 2011 will offer you a look into what concerns the security research community today and in the future. This year’s Las Vegas event will host over 50 training courses from top experts in the field, feature seven Briefings tracks of the latest security research and two workshop tracks dedicated to practical application and demonstration of tools, techniques and open source applications to aid in securing your infrastructure. 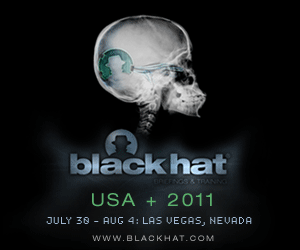 EFF supporters can enter code E9Fs7fa to receive a 20% discount off Black Hat USA 2011 briefings! Register today!